Scottevest’s new Fleece Jacket 7.0 (FJ7) is the best outerwear ever from this innovative company. The reason, in a word, is iPad. FJ7’s dedicated iPad pocket cleans and protects its precious cargo, safely and securely. Previous winners from Scottevest (SEV) include the Travel Vest and the Transformer Jacket. FJ7’s multi-pocket and headphone cable placement system is similar to the vest’s when FJ7’s sleeves are removed, with the exception of the iPad pocket and the fleece material. Transformer is unique in both materials and magnetized sleeve system, and its pockets are completely different than FJ7 and the Travel Vest. 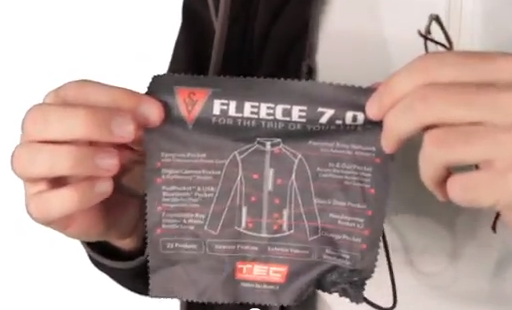 The fleece used for the primary material on FJ7 is, for lack of a better word, delicious. It feels great on the skin and is extremely light weight on the shoulders when loaded with tech gear. The nylon, mesh, and transparent inner materials are strong, versatile, and sewn to perfection. Zippers are great, most of them. Fit and styling are accurate. I am medium height and skinny, so a size small would hug my bony frame. I chose size medium, which works great to contain a ton of accessories, fit over a sweater, and hang comfortably without making me look like a pack mule. Last week I wore FJ7 almost every non-sleeping moment during a trip to Chicago. Aside from a little neck discomfort with SEV’s Personal Area Network cable fabric cover (that is going to be improved soon, says the company), this jacket was a wonder. Wherever I went people admired it for the appearance before they were wowed by what it is able to hold efficiently. Hot weather? No problem. FJ7 breathes surprisingly well in the 95°F heat of Tucson, Arizona. Cool weather and wind? Piece of cake. Blustery Chicago was no match for the materials and craftsmanship in this jacket. It’s not waterproof. SEV’s nylon Transformer Jacket uses an ingenious series of magnets for easy-on-off of the sleeves. No such luck with FJ7’s zippered sleeves, marked left and right. Removing the sleeves is straightforward. You eventually will become adept at re-zippering them into place, because it’s not easy at first, or in adverse conditions. They stow in a convenient rear waist zone that doubles as a lumbar support, or in my case, a place to put my sandwiches and fruit while boarding the airplane. Pad Pocket Protector. 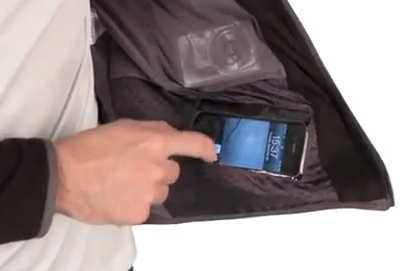 Phone Pocket Too. An iPad fits nicely into the dedicated pocket, as you can see in the company’s promotional video. Because my iPad is inside a massive protective case, I chose to load the iPad pocket with the contents of my vest’s deepest pocket: hat, pad of paper, camera card wallet, and as many other large items as I could fit. I typically use a Classic Vest on a daily basis, so I am accustomed to having just what I need just where I need it, without hunting for it. There are a trillion other dedicated and multipurpose pockets in Scottevest’s Fleece Jacket 7.0. I used them all, from the Clear Touch iPhone/iPod touch sideways hidden pocket to the glasses case pocket to the water bottle pocket to the internal channels for headphone cables, to name a few. Scott Jordan and his team at SEV did an amazing job, as usual, designing and constructing every detail for the top tier traveling techie. The $160 price tag for this jacket is good value. SEV’s products are fully and cheerfully guaranteed. I have used this guarantee twice for my vests, with complete success. If you need a jacket of this quality and versatility but you can’t spare the cash, save up until you can afford it. There is nothing like it at any price from any competitor. Any complaints? Yes! 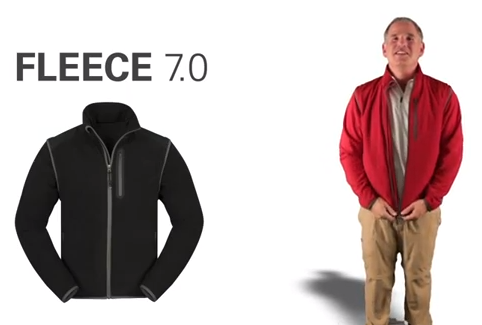 Scottevest’s color guru decided most people want their Fleece Jacket 7.0 to be black. It’s a pleasant black, but it’s still black, not pink or gold. Only 500 special order jackets will be made in a flaming bright red. No tan, no brown, no blue, no purple, no green, no orange, no other colors except for mostly black and a few red. Order now if you want red and not black. Suggestion to company: more colors! People like choice and people like color. Another suggestion: include a collapsed hood in the outer collar. There is ample room for a lightweight nylon or fleece hood that will make FJ7 even more versatile for outdoor use in windy and cool weather. Scott Jordan and his European design partner are especially proud of their “new Quick Draw pocket for your smartphone. New position, clear touch fabric, easy access,” says a company representative. Placing a see-through, touch-sensitive smartphone pocket angled inside the lower left front corner is indeed a bonus. I used this special pocket with my iPod touch during the Chicago trip. I expect Quick Draw to function well with my new iPhone 5 when it arrives next week. Scott Jordan’s video for FJ7. Review from Gotta Be Mobile. Transformer jacket video review with Nemo and Scott. Travel Vest review by Nemo.